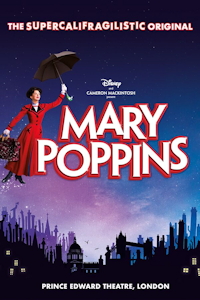 Mary Poppins tickets at Prince Edward Theatre, London. 2019. Find the best Mary Poppins musical tickets at Prince Edward Theatre, West End. Is it Jane and Michael Banks who need a nanny? Or is it their parents, George (the stuffy bank worker) and Winifred who actually need more looking after? Only one thing is certain. When Mary Poppins arrives, with her no-nonsense approach to making the right choices in life, nothing will ever be the same again. Performers Zizi Strallen (Mary Poppins), Charlie Stemp (Bert), Petula Clark (Bird Woman), Joseph Millson (Mr Banks). Book by Pamela Travers. Music Richard M Sherman (1964 film). Music Robert B Sherman (1964 film). Lyrics Richard M. Sherman (1964 film). Lyrics Robert B. Sherman (1964 film). Producer Thomas Schumacher (for Disney Theatrical Productions). Producer Cameron Mackintosh. Director Richard Eyre. Director Matthew Bourne. Lighting Howard Harrison. Lighting Hugh Vastone (new lighting). Design Bob Crowley. Sound Paul Gatehouse. Choreographer Matthew Bourne. Choreographer Stephen Mear. Costume Bob Crowley. From Wednesday, 23rd October 2019. Open 13th Nov 19. Mary Poppins tickets: The tabs above allow you to select between links to suppliers and date searching. Click on a supplier's logo to see their details and on the 'buy now' button to see and check the tickets on offer.